Pool Scouts of Memphis is your go-to source for a perfectly clean pool. Our highly trained pool service experts are dedicated to maintaining crystal clear water and healthy swimming conditions so your pool is a happy place for you and your family to enjoy anytime. With Pool Scouts maintaining your pool, you can stop stressing about managing chemical balances and start slathering on the sunscreen. Our state of the art technology and best in class customer service offers a new level of professionalism and service in the industry. When we say Perfect Pools, Scout’s Honor, we mean it - 100% satisfaction guaranteed. Our team balances pH levels, repairs damaged parts, and offers many more pool service options. Events as minor as leaves falling into your pool can produce tannic acid in the water, causing its alkalinity to go down and resulting in unsightly staining. Located in Memphis, Tennessee, we have been serving middle and south Arkansas, as well as parts of Mississippi, since March 1992. As a leading provider of swimming pool service of all kinds, we understand that your pool is an investment. Keeping this investment in good condition is important, and we achieve this each and every day through honest service and powerful cleaning products. American Pool Tech has been proudly providing personalized service for over 3 years. We offer a variety of services including monthly pool cleaning service, leak detection, pool shock treatment and regularly scheduled maintenance. 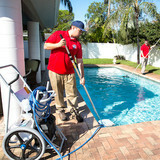 Customers have chosen to entrust their pools maintenance to the personal touch of American Pool Tech. You can be sure you will be receiving unparalleled service. What should I look for when hiring a pool cleaning service in Memphis, TN? Pools and hot tubs are big investments, so you’ll want to make sure to protect them by hiring an expert who cares about them just as much as you do. Check that the Memphis swimming pool maintenance service you are interested in actually specializes in the type of pool you have — chlorine and salt water pools have very different needs, and in-ground versus above-ground pools will require different upkeep and repair methods. Also, know who will be doing the repair or service; if it’s one of the larger swimming pool services in Memphis, TN, request that you get same person every time, otherwise you could get inconsistency in treatments. Good Memphis pool professionals will keep a consistent schedule and log everything they do so that it can be referenced in the event that you switch companies or something does go wrong. Like any other professional, look for local pool cleaning companies near you with plenty of good reviews and relevant experience. Find a Memphis, TN swimming pool repair and maintenance specialist on Houzz. Narrow your search in the Professionals section of the website to spa and pool maintenance companies in Memphis, TN and read reviews and ratings for pros in your area.